No one (apart from babies, I suppose, who never seem to mind) appreciates a soggy bottom, and that's the problem with most of the Beef Wellingtons I've ever eaten. I'm not a fan of greasy puff pastry to begin with - whoever invented the sausage roll has a lot to answer for - and an undercarriage of pastry sodden with meaty juices really ruins a Wellie for me. I do love Beef Wellington, though, so I've spent some time figuring out a method that results in a nice crisp pastry base. This recipe takes time and some attention to detail (not to mention requiring two and a half rolls of pastry), but I reckon that if you're going to spend a fortune on a fine fillet of beef, it's worth putting in the extra effort to produce a faultless end result. Because oven temperatures vary, the cooking times I have given in the recipe are a guide only. I suggest that you cook the Wellingtons for the recommended time, and then test one (the one you're going to eat, of course, or an extra one you've made for testing purposes) by cutting a deep slit into its side to check whether it's perfectly done. If it's too rare, return all the parcels to the oven for a few more minutes. I've left the classic filling of chicken-liver pâté out of this recipe because many people don't fancy it with beef and mushrooms, but if you'd like to include it, stir 6 tablespoons (90 ml) of good pâté into the mushrooms when they've finished cooking. 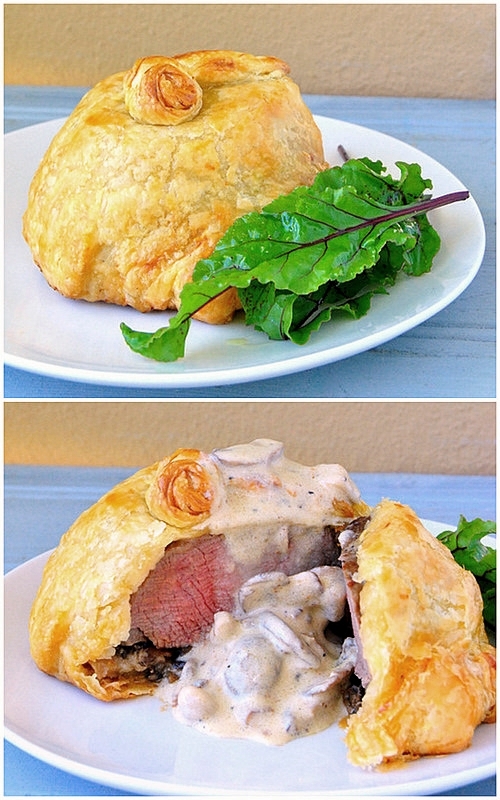 I think Beef Wellington does need some kind of sauce, so serve this with a home-made gravy, or a creamy mushroom sauce or - best of all - a lovely Béarnaise. Put a 60-cm-long sheet of clingfilm lengthways on your counter, place the fillet on top and wrap the plastic tightly around the meat, twisting the ends as if you are making a Christmas cracker. Continue twisting until you have a tight, neat, evenly thick roll that looks like a giant salami. Tuck the twisted ends under the roll, place on a plate and refrigerate for eight hours. When you're ready to start preparing the Wellingtons, heat the oven to 220ºC (for the pastry bases). While the oven is heating, cut the fillet, straight through the clingfilm, into six medallions each 5 cm thick (again, measure them with a ruler, or weigh them using a digital scale - they should weigh 150 grams each, or as close as you can get to this). Peel off the plastic and tie a piece of kitchen string firmly around the 'waist' of each one. This will help the meat hold its shape during the initial browning. Set aside. Put a new sheet of clingfilm on your counter, dust it with a little flour and unroll the puff pastry onto it. Gently roll out the pastry using a lightly floured rolling pin so it's one centimetre bigger on all four sides. Now mark out 6 circles that are half a centimetre (5 mm) bigger in diameter than the medallions of fillet steak you've just cut. You can do this by placing a medallion on the pastry and cutting round it with a sharp knife, or using a suitably sized bowl to mark a circle before cutting it out. Prick the circles all over with a fork and place them on a baking sheet lined with a piece of greaseproof baking paper. Put them in the hot oven and bake for 8-10 minutes, or until they are risen and a light golden colour. Remove from the oven, brush the tops with beaten egg, then return them to the oven for 4-5 minutes, or until golden brown and completely dry to the touch. Lift the circles from the paper and place them on a wire rack to cool. In the meantime, prepare the steaks. Rub a little Dijon mustard on the top and bottom of each medallion and grind over plenty of black pepper. Put a large non-stick frying pan on the hob and heat it for 4 minutes, or until blazing hot. Add the oil, wait for a few seconds until it starts to shimmer, then then put the steaks in. Fry them for exactly one minute (set a timer!) on each side. They should be brown and nicely caramelised top and bottom but still completely raw in the middle. Remove the steaks from the pan and place them on a plate. Cover and allow to cool. To assemble the Wellingtons, divide the mushroom mixture into six portions and pat a generous layer onto the top of each pastry circle. Remove the string from the steak medallions, pat them quite dry on kitchen paper and place them on top of the mushroom layers. Season the stacks with salt, to taste. Unroll the second rectangle of pastry on a sheet of lightly floured clingfilm. Cut it into four equal circles, each one about a centimetre bigger than the pastry bases you cut from the first circle. Put one circle onto a board and very gently roll it out with a floured rolling pin to form it into piece big enough to cover a fillet stack completely. Put a fillet stack on a plate and drape the pastry over it, as if you're throwing a cloth over a table so its edges drape onto the floor. Neatly tuck the edges under the pastry base. (If you like, you can flip the whole bundle over to do this). If there are any tears, patch them with bits of left-over pastry. Repeat the process for the remaining two stacks, using the remaining pastry. Shape and nudge the parcels between your palms to form nice neat towers. Brush the pastry all over with beaten egg, and use the left-over trimmings to add some leaves, roses and similar extravagant flourishes to the top. Brush the trimmings with beaten egg. Now use the tip of a sharp knife to cut a four-millimetre slit in the top of each Wellington, so steam can escape. Put the parcels in the fridge for 30 minutes to firm up, then brush with another coating of egg. At this point, you can refrigerate the parcels, lightly covered with clingfilm, for up to 24 hours, but make sure that the pastry bases, the mushrooms and the steaks have cooled to room temperature before you assemble the parcels, and take them out of the fridge 30 minutes before you bake them. Bake the Wellingtons on a sheet lined with greaseproof baking paper at 200º C (or 210º C if you don't have a fan-assisted oven). For a pastry parcel containing a steak weighing 150 grams, 20 minutes will give you a perfect rose-pink. If you want a bloody steak, cook them for about 15 minutes, and if it's well done you're after, 25-30 minutes. As mentioned in my introduction above, it's not a bad idea to make an extra Wellington, using a left-over fillet medallion of the same weight, to use as a 'guinea-pig'. Serve piping hot with a sauce of your choice. There will be some wastage if you buy a whole beef fillet, as you will use only the thicker part of the fillet. It might be more economical to ask you butcher to cut you six 150-gram medallions. When you're peeling the 'silver skin' from the fillet, tear it away from the thin end of the fillet towards the thicker end. If you try doing this the other way round, it won't come away neatly. Use a good-quality all-butter puff pastry; I always use the Woolworths brand. Avoid the brand called 'Today' which tastes synthetic and always, but always, cracks when you unroll it. Lovely Jane, Love the individual portion, then i do not have to share, he-he!! remind me to bring yyou some proper butter pastry, best in CT! Wow,wow,wow!! !It looks and sounds wonderful!! Can I come over to your house for this??? More attention to detail than I have managed in my entire life ;) It looks totally fantabulous! Wow!! looking delicious to me.I definitely try this at my home.